Posted on Wed, Mar 7, 2012 : 7:24 a.m.
With one exception, this week’s listings are all about the American experience, which seems appropriate with so much of the 2012 election rhetoric already in full swing. Theater, in its truest form, provides a civic dialogue on the issues that unite or divide us. From the idiosyncrasies of one of America’s royal families in “Grey Gardens,” to a hot and sultry exploration of fading Southern gentility in “A Streetcar Named Desire,” to a down and dirty romp across the Wild West’s baddest lands in “Dead Man’s Shoes,” each of these plays takes a different look at that expansive genre, Americana. Even Beckett’s existential masterpiece “Waiting for Godot” originally penned in French, and translated by the author into English, seems topical in this day and age. An exploration of humans in relation to God, for whom they wait, they claim he's an acquaintance when in fact they hardly know him, and admit that they would probably not recognize him if they saw him. Show: "Waiting for Godot" by Samuel Beckett, one-time event, March 9 at 8 p.m. Description: This tragicomedy about the meaning of human existence and our relationship to God was revolutionary when it was first produced in the 1950s and remains one of the most intriguing plays of the modern theater. It will be performed by students from the RC Play Production Seminar on Beckett and Pinter and directed by Kate Mendeloff and Martin Walsh. Description: “A Stone Carver” tells the story of a retired stonemason who clings to the past, and his son who refuses to look back. When Agostino, a seventh-generation stone carver, is evicted from his home to make space for a highway, he barricades himself in his house, determined to outlast the bulldozers. In a last-ditch effort to save his father from jail, Agostino’s only son, Raff, arrives at the house with his new fiancÃ©e. A battle of wills ensues, putting their already-rocky relationship to the test. Can Raff convince his father to move forward before it’s too late? Fun fact: The barrel stool on the set is from the Dexter Cider Mill, the oldest continuously operating cider mill in Michigan. Description: A hilarious and heartbreaking story of Big Edie and Little Edie Bouvier Beale, the eccentric aunt and cousin of Jacqueline Kennedy Onassis, once bright names on the social register who became East Hampton’s most notorious recluses. 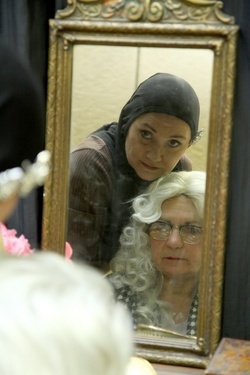 Based in part on the cult-classic documentary “Grey Gardens” the musical--focuses first on the pair in 1941, when they were the cream of East Hampton society. Behind the glittering and glamorous exterior of Grey Gardens and the family’s social whirl, we see cracks in the foundations. The second act takes place in 1973, where the pair is living reclusively among cats and raccoons in the squalor that once was the beautiful estate, Grey Gardens. Fun fact: The actress playing young Lee Bouvier is the real-life daughter of Kathy Waugh, who is playing Little and Big Edie. Description: "The Carol Burnett Show" brought an original brand of wacky comedy into American homes every Saturday night from 1967 to 1978. Featuring notoriously unpredictable sketches performed by a stellar ensemble, it was one of television's most successful variety shows of all time. The Saline Area Players, under the direction of Tami Hindes, brings these classic sketches to the stage. Fun Fact: Carol Burnett, Tim Conway, Harvey Korman, Vicki Lawrence, and Lyle Waggoner were among the beloved ensemble members of the hit television comedy. Fun fact: In addition to his most well-known works, “Compleat Female Stage Beauty,” which he later adapted into a screenplay, and “Tuesdays with Morrie,” co-authored with Mitch Albom, Jeffrey Hatcher also wrote the screenplay "Casanova" for director Lasse HallstrÃ¶m as well as contributing to the Peter Falk TV series "Columbo." Description: There is a very short list of 20-century American plays that continue to have the same power and impact as when they first appeared. Tennessee Williams' Pulitzer Prize winning masterpiece is one. The story of the fading Southern Belle Blanche DuBois, driven in desperation to stay in her sister Stella’s New Orleans apartment, with her brutal and sensuous brother-in-law, Stanley Kowalski, is considered one of the great American classics.